At first the pantry included food items, but Mandy soon realized it was one of a number in the community that served the needy. She also recognized that minimal amounts of hygiene and cleaning items were available. “I noticed that the town had more than seven food banks, and I figured they had the same problem. So I did my research, and it was true,” Mandy said. In learning about the lack of hygiene and cleaning item related donations within other community food pantries, Mandy decided to start a non-food pantry, a resource for hygiene and cleaning products. 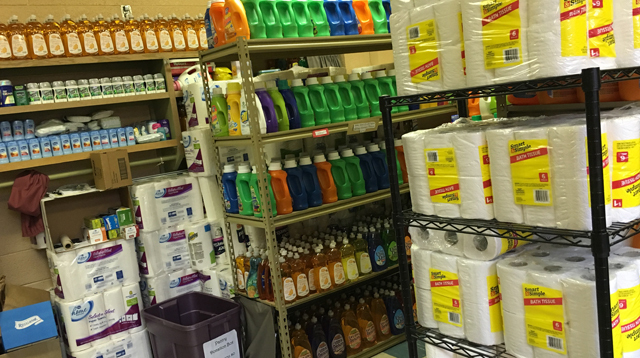 The pantry at Community of Hope supplies people with a kit that contains a variety of cleaning and hygiene products including: toilet paper, paper towels, shampoo, soap, toothpaste, dish soap, and deodorant. Since February 2016, several volunteers have joined to help with distribute. 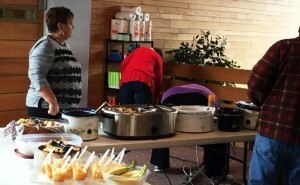 About that time, the church began serving a brunch style meal as well. “Now families can come [enjoy] a meal and then pick up their kits,” Mandy said.